April | 2010 | How green is my valley? Sheesh! The third ‘Prime Ministerial’ debate made it clear that the ‘choice’ as served up by the mainstream media is between three centre-right parties. Watching them vie with each other about who had the ‘toughest’ agenda made me feel slightly sick. Who was there to stand up for human rights, compassion and common bloody decency? And where are those subjects in today’s frantic coverage? I couldn’t care less who ‘won’ – not the environment, not the poorest and not the neediest, that’s for sure! We have a centuries-old tradition of welcoming people from other countries and cultures. When did that get banjaxed? I don’t know, but last night those three blokes in suits fell over each other to assure us that they wanted to stop the nasty foreign folk coming over here and taking all our jobs. There was no mention of the inconvenient stats showing that your average migrant is a well-educated asset to our workforce. And even if they weren’t, what happened to the politics of caring for other people? The other disturbing topic, which has so far excited no après-match comment at all, is the apparent end of unemployment benefit as we know it. Yes folks, Gordon said “no more life on the dole” and the other two then both tried to position themselves to the right of that very rightwing position! Before you descend with your abusive rebuttals, he did mean an end to people spending their whole lives on benefits. Undesirable though a lifetime without work is, nobody mentioned the likely upshot. So let me be the first – how long before the first Death of someone because they couldn’t get the dole? Or the death of their children? I have three things to say to the three white men: no, no and NO. For once, I was included in an invitation to argue the toss with my fellow candidates. Many thanks to Calder High School for getting me together with my Lib Dem and Tory colleagues for a discussion and Q&A. It was well attended by the Sixth Formers despite their looming exams. 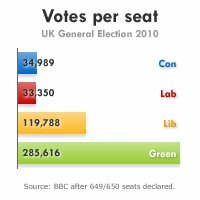 Sadly the post-match vote went to the Lib Dems (the Clegg effect) but the Greens came second and I’d happily settle for that on May 6th. In case you’re wondering (and at this stage you probably aren’t) our Labour opponent was once again unavailable…..
That particular gap isn’t my subject, though. I had ten minutes to talk to the 6th formers about Green policies, and my main theme was the subjects which somehow haven’t figured in this election campaign. Against all the odds, I’ve managed to finish ‘Wolf Hall’. It’s taken me a whole month, which shows how frantic life is on the campaign trail. Because some of my fellow book group members see this blog, I’ll resist the temptation – and it is a temptation – to analyse it here. That needn’t stop me pointing up the similarities between courtly intrigue under the Tudors and a Pennine election campaign in 2010! Machiavellian fixers, marriages of convenience which become inconvenient, briefings off the record, dissing the Pope, rival factions with their own candidates for the monarchy, burning your opponents at the stake…not much has changed has it? (Well ok, maybe the burning at the stake, but the rest all seems familiar). Thank God for the NHS and 21st century sewage, though….. In the dying days of New Labour, it seems only fitting to give this prestigious award to Karl Marx. What’s the connection between the two? That’s right – absolutely nothing! I make no claims for KM as an environmentalist, but our horribly imperfect world would be even more horribly imperfect if it hadn’t been for Marx and Engels. And if they were around for this election, they’d be looking at Green policies (public ownership of essential services, redistributive taxes etc) and reaching the only logical conclusion….. Reviewing the blog for the last few weeks, I’m surprised that I haven’t gone on about inequality a lot more! I read ‘The Spirit Level’ (Wilkinson and Pickett 2009) shortly after hearing Kate Pickett at the last Green conference (see No Guardians in Finchley) and I strongly recommend it. The latest epidemiology illustrates what most of us have always known instinctively: inequality is bad for everyone, not just the poorest. There’s a wealth (ha!) of evidence that the most unequal developed countries have the lowest life expectancy, worse overall health, higher crime and prison populations, poorer literacy and educational achievement blah blah. Let’s be very clear about this – it’s not just ‘the poor’ who are affected, we all are! They have a bunch of graphs illustrating the statistical link. I don’t even need to tell you which are the most equal societies (the usual suspects plus Japan, where they have a longstanding culture of relative economic equality). Nor do I have to tell you where the UK comes – yeah, third worst after Portugal and the USA! Time to examine the Posh Boy issue a bit further. In response to one of my Lib Dem correspondents (do keep visiting these shores, by the way) I gave Nick Clegg credit for rising above his background and not becoming David Cameron. I also accept that Clegg, Cameron, Osborne, Boris et al aren’t to blame because they went to expensive exclusive schools. HOWEVER there are two issues here. Firstly, only 7-8% of people attend public schools, but these same chaps (for chaps they are, usually) attain rather more than 7% of the power and influence! Wherever there’s money, wherever there’s authority, there you will find your ex-public schoolboys. Secondly, Cameron and Clegg have spent their lives in cocoons of privilege and have never had anything resembling a proper job. Just think of that famous Bullingdon Club picture – the one we’re not allowed to see – and ask yourself how much they can know about ordinary life. I’m the product of professional parents and a grammar school – I don’t claim to have been disadvantaged. But everyone in this country knows that by sending your kids to a ‘top’ public school you buy them a huge head-start in life. Don’t blame the kids, don’t blame the parents, don’t blame the teachers, but blame the antediluvian system of entrenched privilege. Anyone think Nick or Dave are about to change it?